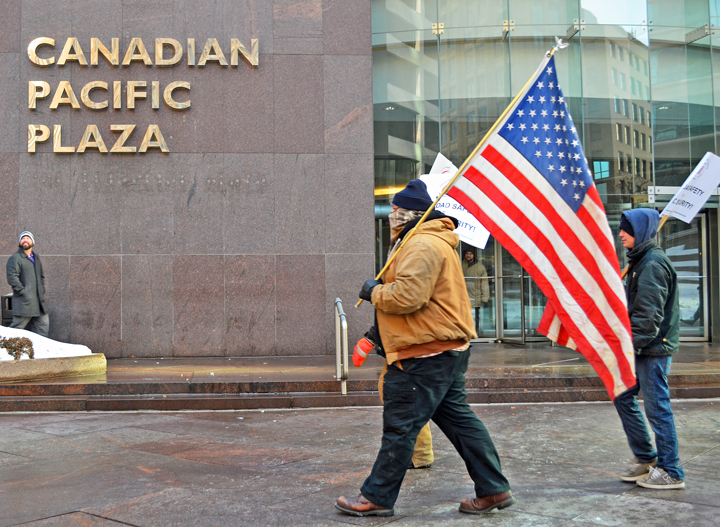 UTU members join informational picketing outside Canadian Pacific’s offices downtown Minneapolis. That’s rail worker Corey Plath’s assessment of Canadian Pacific Railway under the direction of CEO Hunter Harrison, who has made a career of cutting costs and, union members say, cutting corners when it comes to the safety of workers and the public. 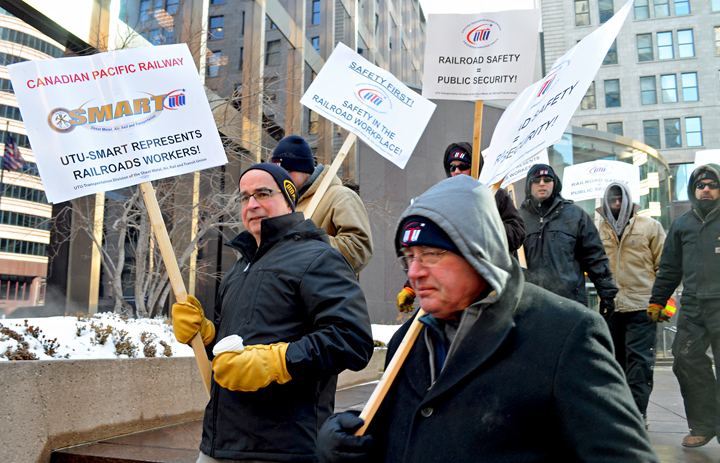 Plath and fellow Minnesota-based members of the United Transportation Union have staged informational picketing outside Canadian Pacific’s offices downtown Minneapolis twice this month, raising awareness of “deteriorating” safety standards that have accompanied a massive restructuring initiative at the rail carrier’s parent company. The UTU represents railroad conductors, engineers, switch operators and yardmasters at Canadian Pacific. The union’s legislative director in Minnesota, Philip Qualy, said union leaders have “attempted to work in partnership with Canadian Pacific to identify safety issues while improving efficiencies” over the past 13 months. But those efforts have been met with resistance from management, Qualy said, and that starts with Harrison, Canadian Pacific’s CEO. Harrison came out of retirement to take the reins of Canadian Pacific in June 2012. He was recruited for the job by William Ackman, founder of a hedge fund that had been aggressively buying stock in the railway’s parent company with an eye toward restructuring – and, later, reselling the stock for a tidy profit. Ackman pegged Harrison for the job because of his record as CEO of Canadian National Railway from 2003 to 2009, when Harrison oversaw an overhaul of Canadian National operations that increased the railway’s efficiencies, but drew sharp criticism from safety regulators. A 2007 investigation into rail safety by the Canadian government chastised Harrison’s company for creating a culture of fear that stifled employee participation in efforts to identify safety concerns. Now, workers say Harrison is doing the same thing at Canadian Pacific. UTU members who work at Canadian Pacific report being refused meal and other breaks during 12-hour shifts in sub-zero weather conditions, and they say managers harass and intimidate workers who speak up about safety concerns. “People aren’t saying anything or they’re afraid or threatened with discipline or job loss – so they’re not saying what they notice,” Plath said. What’s more, UTU members allege Canadian Pacific has cut costs by removing safety equipment from switching yards, eliminating emergency exit routing and decreasing mechanical inspections for trains carrying hazardous materials. Already, a string of train derailments has plagued Canadian Pacific’s restructuring effort. In March 2013 a Canadian Pacific train derailed in western Minnesota, spilling more than 20,000 gallons of crude oil onto the frozen ground.